Wood tables can add a classical air to the decor of your home and making them yourself is a fun, inexpensive way to spruce up both your house and your craftsmanship. Although there are many types of wood you can use to build a table top, hardwood floors are a good, sturdy material to work with. Before you design and create a dining room table, start with a smaller project, such as an end table, to practice the trade. Make your own personalized, rustic table tops out of hardwood flooring. Draw a simple diagram to plan out the dimensions of the table top you would like to make. Mark the table top's length and width measurements on the diagram. Adjust your miter saw to cut at a 90 degree angle. Cut your hardwood planks about 1 inch from ends with the miter saw. This will ensure that the final project has smooth, uniform sides. Slip the metal hook of a measuring tape over the end of a plank. Pull the tape to measure the length you need and make a small mark there with a pencil. Extend the pencil mark across the width of the plank with a carpenter's square. Line up the blade of the miter saw with the pencil mark and cut the plank. Repeat steps 4 and 5 for the remaining pieces. Arrange your cut planks on a floor or table, placing them together width-wise. Apply wood glue to the long edges of the boards that you will glue together, then clamp the planks together with a large glue clamp. 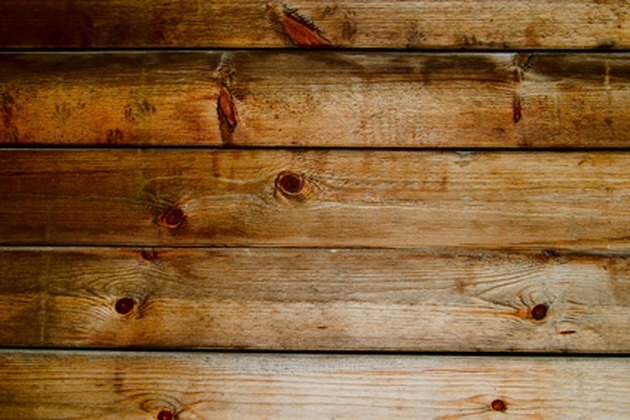 Wipe away any excess wood glue with a cloth or paper towel and allow the glue holding the planks together to dry completely. Remove the clamp and sand away any remaining excess wood glue. Stain or seal the wood if you wish.